Most recent update below: Wed, Sept 2, 9:04am PDT (new updates in red). 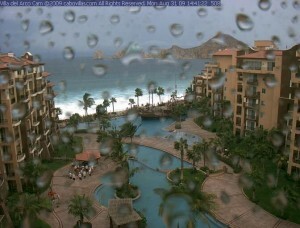 A major hurricane, Jimena, is passing Todos Santos. The current conditions are about 80 degrees with sporadic rain. Water is 80 degrees plus.Jimena weakens and is now Cat 2. Recent Public Advisory 20 at the bottom of this post. TODOS SANTOS STILL HAS SOME MAGIC AND APPARENTLY MISSED WHAT COULD HAVE BEEN DEVASTING BUT WE ARE NOT OUT OF THE WOODS YET. DAMAGE REPORT TO COME LATER TODAY. The computer models are split, with one camp calling for a landfall in southern Baja, and the other camp calling for landfall farther north near central Baja. The official NHC forecast splits the difference between these two solutions, and landfall could occur anywhere along a long stretch of the Baja coast. At this point, the UKMET model’s solution taking Jimena westward out to sea is being discounted, since it is an outlier. The model indicates a 13% the Jimena will hit land near Cabo. At 11:00 AM PDT the center was at 21.5 degrees north and 111.0 west. 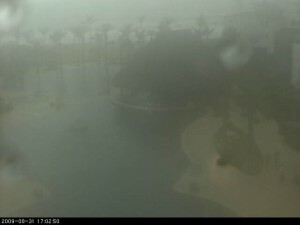 At 500 PM PDT…0000 UTC…the center of Hurricane Jimena was located near latitude 18.8 north…longitude 109.2 west or about 285 miles…460 km…south of Cabo San Lucas Mexico. A Hurricane Warning has now been issued. A HURRICANE WARNING MEANS THAT HURRICANE CONDITIONS ARE EXPECTED SOMEWHERE WITHIN THE WARNING AREA WITHIN 24 HOURS. PREPARATIONS TO PROTECT LIFE AND PROPERTY SHOULD BE RUSHED TO COMPLETION. Nervous locals are removing satellites, solar panels and covering gaps in doors and windows, many wishing they had storm shutters. They are buying water and food. We’ll monitor the progress a keep you updated here; however, everyone in Todos Santos expects to lose power at some point so communications may be limited after Tuesday. Jimena is expected to produce total rain accumulations of 5 to 10 inches over the southern half of the Baja California peninsula and portions of western Mexico during the next 2 days…with possible isolated maximum amounts of 15 inches. Much of the damage caused to Baja by prior hurricanes was due to flooding and mudslides. A storm surge along with large and dangerous battering waves will produce significant coastal flooding along the Baja California peninsula. “There’s a good chance this system could be a Category 5 in the next 24 hours,” said Dave Roberts, a hurricane specialist with the National Hurricane Center. 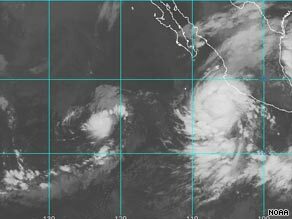 As of Tuesday afternoon, Jimena was located about 70 miles east of Todos Santos Baja California. The storm is expected to continue in a north-northwest motion and approach the southwestern tip of Baja California sometime early Tuesday. Jimena is the 10th named storm of the Pacific season. PROTECT LIFE AND PROPERTY SHOULD BE RUSHED TO COMPLETION. POSSIBLE WITHIN THE WATCH AREA...GENERALLY WITHIN 36 HOURS. MAINLAND MEXICO FROM ALTATA NORTHWARD TO BAHIA KINO. NORTHWESTERN MAINLAND MEXICO SHOULD MONITOR THE PROGRESS OF JIMENA. ABOUT 255 MILES...410 KM...SOUTHEAST OF PUNTA EUGENIA MEXICO. JIMENA IS MOVING TOWARD THE NORTH-NORTHWEST NEAR 13 MPH...20 KM/HR. MEXICO NEAR CABO SAN LAZARO. IS STILL FORECAST TO BE A HURRICANE WHEN IT MOVES INLAND. ESTIMATED MINIMUM CENTRAL PRESSURE IS 973 MB...28.73 INCHES. 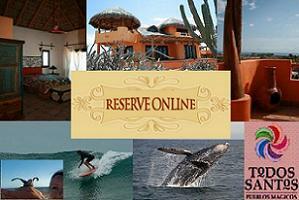 Welcome to the website for CalyCanto, offering Todos Santos vacation rentals and information about the area. We operate a boutique community, currently consisting of 3 casitas in Todos Santos, each with ocean views, about 2.5 miles from the town center, on the way La Pastura, a world class surf break. We at CalyCanto are passionate about eco-friendly travel that provides us with succulent surfing, pristine beach combing, intimate restaurants, exotic bird watching, super special sunsets, horseback riding on the beach, local tours and activities that support the local community. We believe in causing the least harm (approaching zero) while doing business. Environmentalism, sustainability and a commitment to protecting the natural environment through activism are part of our mission as we work to continually reduce our carbon footprint. We hope you'll follow our adventure here, on Twitter and on Facebook while you enjoy your coffee (or tea) or drink a Pacifico (if you've already made it here). If the tequila gets passed around the table too much, gringos might try and spell CalyCanto like calicanto, calecanto, or cal y canto. However you spell it, you are always welcome at Calycanto Casitas. Thank you for visiting.